There are two crucial issues in the treatment and management of headache patients: More than 50% of individuals experiencing headache have only been treated symptomatically, with no appropriate diagnosis established; and history and neurologic examination are essential to establishing a diagnosis, and thus selecting appropriate therapy. 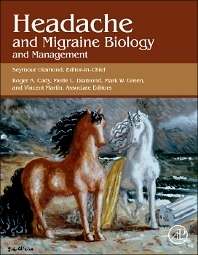 Headache and Migraine Biology and Management is a practical text that addresses these issues, featuring contributions from expert clinical authors. The book covers in detail topics including chronic and episodic migraine, post-traumatic headache, sinus headache, cluster headache, tension headache, and others. Chapters are also dedicated to treatment subjects, including psychiatric and psychological approaches, medication overuse, inpatient treatment, and pediatric issues. This book is an ideal resource for researchers and clinicians, uniting practical discussion of headache biology, current ideas on etiology, future research, and genetic significance and breakthroughs. This resource is useful to those who want to understand headache biology, treat and manage symptoms, and for those performing research in the headache field. Is Angiography Safe in Migraine? What Happens to our Patients as They Grow Up? Summary: What is the Psychiatric Approach to Headache? A pioneer in the headache field, Dr. Seymour Diamond has spent almost 50 years developing better diagnostic tools and treatment options for headache conditions and has played integral roles in transforming the entire field's approach. A recipient of the American Headache Society’s Lifetime Achievement Award, he has accomplished a laundry list of “firsts” in the field of headache medicine, his greatest contribution being his unwavering commitment to creating the first true continuum of care for patients. Dr. Diamond is Executive Chairman and Founder of the National Headache Foundation and Director Emeritus and Founder of the world-famous Diamond Headache Clinic. He previously served as Adjunct Professor of Cellular and Molecular Pharmacology at Chicago Medical School at Rosalind Franklin University of Medicine and Science, North Chicago, Illinois, as well as a Clinical Professor in the Department of Family Medicine. Also, he served as a Lecturer, Department of Family Medicine (Neurology) at Loyola University Chicago/Stritch School of Medicine. He received his medical degree from the Chicago Medical School, and was honored with the Distinguished Alumni Award in 1977 and the President's Award in 2002. He has been elected as a fellow of the Royal Society of Medicine, Neurology Section, has received the National Migraine Foundation Lectureship Award, and was honored by the British Migraine Trust as the initial recipient of the Migraine Trust Lectureship. He has also served as editor or on the editorial board for 31 publications; has published more than 490 articles in professional literature; and has authored or co-authored more than 70 books. I'm not clear whether this is a review of the book, or the state of knowledge that the book represents... I found the book incredibly detailed, but in the end, added very little to my understanding. As a migraine sufferer, with incidents triggered by high intensity exercise, I was going to learn more about managing and controlling such headaches. But the text barely even notes that phenomenon, and has few pointers to managing my issues. Many of the techniques that I and fellow sufferers have discovered (e.g. warming up, warning down carefully, avoiding carbo deficit bonks, etc.) Are not discussed. Disappointing for a book labeled as the definitive text on headaches.